What is it? A tool to create smart Twitter lists (and more). How is it of use to journalists? 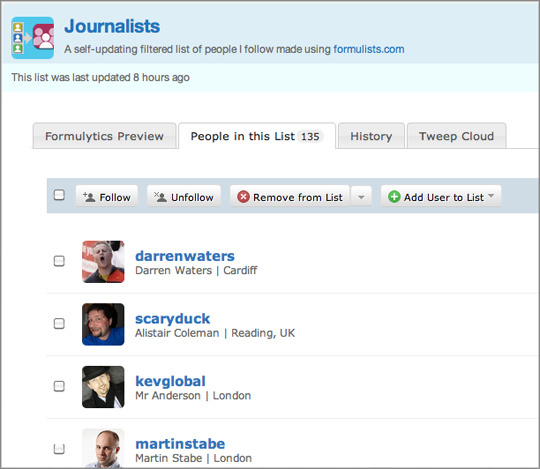 Formulists is a fantastic tool to create Twitter lists. Simply sign in with your Twitter account, search for a keyword such as “journalist” and Formulists will create a Twitter list of all the people you follow with the word “journalist” in their profile. Formulists found that 135 people I follow include the word journalist in their profile, for example. Here is the Twitter list. But be warned: Formulists is shutting down. You can still create lists but they will no longer be automatically updated. It is a real shame this tool is being pulled, particularly as Twitter lists are a great way for journalists to filter those they want to follow and focus on. If your “all friends” stream has become too busy, make it more manageable by creating lists based on keywords while you still can. Your lists will not be updated as you follow additional Twitter users but Formulists provides a great way to start creating new lists. It is worth exploring Formulists as it allows you to do more than simply create lists, such as allowing you to search for new Twitter users by topic. The Formulists blog also points out some additional Twitter filtering tools. This entry was posted in Handy tools and technology, Social media and blogging, Tool of the Week and tagged Formulists, Twitter, Twitter lists on January 24, 2012 by Sarah Marshall.